Bramah can secure most hinged door applications. Due to the Bramah mechanism being incorporated within the lock case, (though we do use cylinders for some applications), the design and finishes blend in discretely with most doors and buildings. So whether you need a lock for a heritage building, a modernist one, or even a shop front with a metal door, our hinged door locks are the ones to look for. Finishes available as standard include Nickel, Brass, and BMA (Bronze Metallic Antique) with black and polished chrome being available as standard specials. Bramah, in partnership with Safeguard Doors Ltd, have had the Bramah MD deadlock tested, in a vigorous real life test. Click on the Video link below to see the extraordinary results. 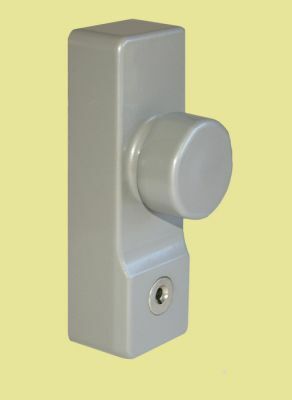 Bramah, in partnership with Fred Duncombe Ltd, are able to offer the CE marked Exidor Range of Emergency Exit Hardware. Below are details of the Outside Access Device which utilises the Bramah CP17 cylinder and also is fully compatible with all other Bramah locks for passing and master suiting purposes. When ordering, the Outside Access Device and Bramah cylinder should be ordered together, as a small adjustment to the standard CP17 is required, to allow a 'snug' fit. Customers ordering a CP17 separately should state it is for a Exidor Outside Access Device.